Septal, reticular, nodular, reticulonodular, ground-glass, crazy paving, cystic, ground-glass with reticular, cystic with ground-glass, decreased and mosaic attenuation pattern characterise interstitial lung diseases on high-resolution computed tomography (HRCT). Occasionally different entities mimic each other, either because they share identical HRCT findings or because of superimposition of patterns. Idiopathic pulmonary fibrosis (IPF), fibrosis associated with connective tissue disease, asbestosis, end-stage sarcoidosis or chronic hypersensitivity pneumonitis (HP) may present with lower zone, subpleural reticular pattern associated with honeycombing. Lymphangiomyomatosis may be indistinguishable from histiocytosis or extensive emphysema. Both pulmonary oedema and lymphangitic carcinomatosis may be characterised by septal pattern resulting from thickened interlobular septa. Ill-defined centrilobular nodular pattern may be identically present in HP and respiratory bronchiolitis–associated with interstitial lung disease (RBILD). 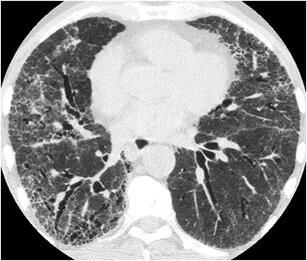 Sarcoidosis may mimic miliary tuberculosis or haematogenous metastases presenting with miliary pattern, while endobronchial spread of tuberculosis may be indistinguishable from panbronchiolitis, both presenting with tree-in-bud pattern. Atypical infection presenting with ground-glass mimics haemorrhage. 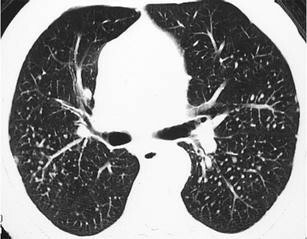 Ground-glass pattern with minimal reticulation is seen in desquamative interstitial pneumonia (DIP), RBILD and non-specific interstitial pneumonia (NSIP). Obliterative bronchiolitis and panlobular emphysema may present with decreased attenuation pattern, while obliterative bronchiolitis, chronic pulmonary embolism and HP may manifest with mosaic attenuation pattern. Various mimics in interstitial lung diseases exist. Differential diagnosis is narrowed based on integration of predominant HRCT pattern and clinical history. 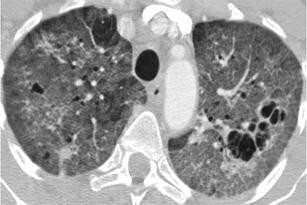 • To learn about the different HRCT patterns, which are related to interstitial lung diseases. • To be familiar with the more “classical” entities presenting with each HRCT pattern. • To discuss possible overlap of different HRCT patterns and the more common mimics in each case. • To learn about some clues that help differentiate the various diagnostic mimics on HRCT. 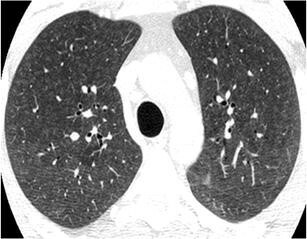 Since the advent of high-resolution computed tomography (HRCT) in the 1990s the understanding of interstitial lung disease has dramatically changed. 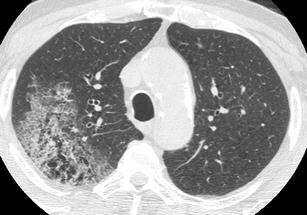 As CT descriptions of the various diffuse lung diseases are being continuously refined and certain CT characteristics are considered pathognomonic while others become less specific, HRCT finds its role in an integrated approach of diagnosis where it provides sufficient information to produce a differential diagnosis and in many cases allows a non-invasive definitive diagnosis . 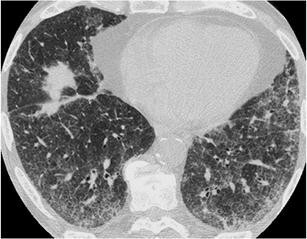 There are various patterns of interstitial lung disease on HRCT, each one representing different interstitial lung diseases with completely different histological appearances and clinical manifestations. 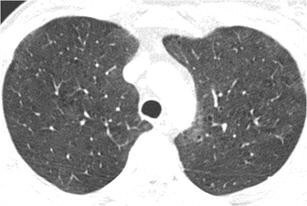 The main distinct interstitial HRCT patterns are five: septal, reticular, nodular, cystic, ground-glass and decreased lung attenuation pattern. 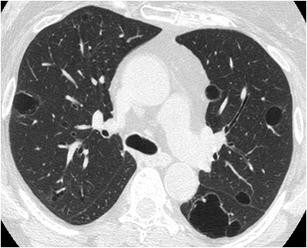 Although each HRCT pattern encompasses many different interstitial lung entities, the contrary may also occur, namely one entity may present with many different patterns and have many different “faces”. To make things even more complicated, there may be overlap of HRCT patterns in one entity. In everyday clinical practice one should try to combine the different HRCT patterns or identify the predominant pattern in order to make the correct diagnosis [2, 3]. Integration of HRCT findings with clinical findings and the knowledge of acute or chronic symptoms is crucial to reach the correct diagnosis. The most common HRCT patterns include the septal, reticular, ground-glass opacity, crazy paving pattern, mixed ground-glass opacity and reticular, nodular tree-in-bud pattern, nodular without tree-in-bud pattern, nodular with ill-defined centrilobular, reticulonodular, cystic, mixed cystic with ground-glass opacity, decreased attenuation and mosaic attenuation pattern (Table 1). For the easier approach to this review by the reader, we describe a “classic” entity and the various “mimics” for each HRCT pattern. The “classic” entity is selected in an arbitrary way either because it may be the most representative and commonly one reported for the specific HRCT pattern or because it may be the entity for which, the specific HRCT pattern was initially described. Septal pattern is defined as thickening of the interlobular septae (i.e. the borders of the secondary pulmonary lobules). Normally very few interlobular septae are seen in the anterior and lower aspects of the lower lobes on HRCT. Thickened interlobular septae are demonstrated as short lines extending perpendicularly to the peripheral pleura or the fissures, or as polygonal arcades surrounding secondary pulmonary lobules more centrally. Septal thickening can be smooth, nodular or irregular . The prototype disease entity with smooth septal thickening is hydrostatic pulmonary oedema (Fig. 1). 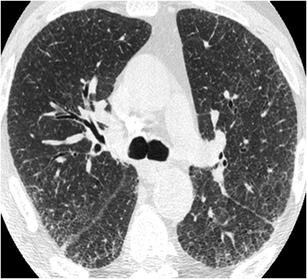 HRCT is usually not performed to diagnose pulmonary oedema, since the diagnosis is based on clinical and radiographic findings, but it may rarely be performed upon discrepancy between the clinical history and the chest radiograph . It has a perihilar and lower lobe predominance and it is usually associated with areas of ground-glass opacity and consolidation. Pleural effusion—usually bilateral, symmetric and extensive—is a common finding. Key findings in hydrostatic pulmonary oedema are cardiomegaly, dilatation of pulmonary veins, peribronchovascular thickening and lower lobe predominance. However, pulmonary oedema may occur in the absence of an enlarged heart silhouette in cases of mitral reflux, left atrial enlargement and elevated pulmonary artery pressure . There are many “mimics” of the septal pattern: lymphangitic carcinomatosis, sarcoidosis and Niemann-Pick disease, Erdheim-Chester disease, cystic lymphangiectasia and occasionally pulmonary fibrosis. Lymphangitic carcinomatosis is characterised by nodular—and less commonly by smooth—thickening of any part of the peribronchovascular interstitium, apart from the interlobular septal thickening (i.e. intralobular interstitium, centrilobular interstitium, fissures). Lymphangitic carcinomatosis may be caused by pulmonary or extrapulmonary neoplasms (breast, pancreas, gastrointestinal, prostate cancer). When it results from lung cancer it may be focal and unilateral, whereas when it results from extrapulmonary neoplasms it is usually bilateral and symmetric. Lymphangitic carcinomatosis may be central or peripheral. Pleural effusion and lymphadenopathy is seen in 30 and 40 % of cases, respectively  (Fig. 2). 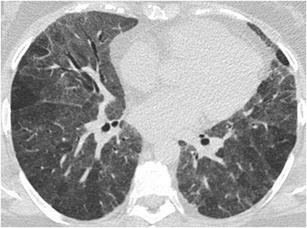 Mimic of nodular or smooth thickening of the interlobular septae is sarcoidosis. Actually sarcoidosis is a great mimic of any pattern since it may present with many different forms. When it is manifested with septal pattern—as the predominant pattern—it may also exhibit intralobular thickening, linear opacities and perilymphatic distribution of micronodules that may add to the nodular thickening of the interlobular septae [7, 8]. There is usually an upper/middle and central/perihilar predominance in sarcoidosis (Fig. 3). The presence of beading of the fissures (due to the perilymphatic distribution of the micronodules) and the presence of mediastinal lymphadenopathy that may occasionally have the characteristic “icing sugar” calcification are the key findings in the diagnosis of sarcoidosis . Niemmann-Pick disease is an uncommon mimic of the smooth septal pattern which results in extensive, bilateral and symmetric thickening of the interlobular septae  (Fig. 4). Key findings may be the extensive distribution of abnormalities and the absence of cardiomegaly, lymphadenopathy or beading of the fissures. Splenomegaly is often observed in the upper abdomen (Fig. 4). Erdheim-Chester disease , cystic lymphangiectasia  and pulmonary lymphangiomatosis  are three other uncommon mimics of smooth septal pattern. 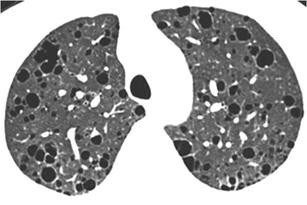 Irregular thickening of the interlobular septae may be seen in pulmonary fibrosis but this rather constitutes an ancillary finding instead of the predominant pattern. On HRCT, reticular pattern is characterised by innumerable interlacing shadows suggesting a mesh. The constituents of the reticular pattern may be all or some of the following: interlobular septal thickening, intralobular interstitial thickening, wall cysts of honeycombing, peribronchovascular interstitial thickening and traction bronchiectasis/bronchiolectasis . The prototype entity for reticular pattern is idiopathic pulmonary fibrosis, which is characterised by subpleural and posterior predominance of intralobular interstitial thickening, traction bronchiectasis/bronchiolectasis, irregular interlobular septal thickening and honeycombing. Areas of ground-glass opacity associated with bronchiectasis and bronchiolectasis may also coexist, but areas of pure ground-glass opacity are extremely rare. Key findings for idiopathic pulmonary findings are the lower, posterior and subpleural predominance and the presence of honeycombing  (Fig. 5). The major mimics of idiopathic pulmonary fibrosis and therefore of reticular pattern are non-specific interstitial pneumonia (NSIP), asbestosis, chronic hypersensitivity pneumonitis, rheumatoid arthritis, desquamative interstitial pneumonia (DIP) and end-stage sarcoidosis. NSIP is characterised by lower lobe and subpleural predominance of mild reticulation (depending on the subtype of NSIP, i.e. cellular, mixed, fibrotic), ground-glass opacity that may be pure, areas of consolidation and minimal if any honeycombing. HRCT may differentiate idiopathic pulmonary fibrosis (IPF) from NSIP in most cases, although considerable overlap may exist . 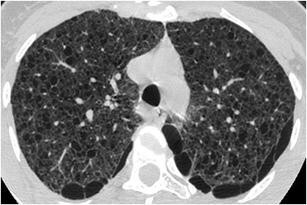 Clues that may differentiate NSIP over IPF are the presence of more ground-glass opacity and less—if any—honeycombing  (Fig. 6). Asbestosis also presents with reticular pattern as the predominant pattern and may therefore mimic IPF. It is characterised by the presence of subpleural reticulation with subpleural dot-like opacities, at the early stages. There may be areas of ground-glass opacity and the findings are predominantly at the posterior and basal segments. At later stages honeycombing is a common finding. Clues for the differential diagnosis from IPF may be the presence of pleural plaques, diffuse pleural thickening, subpleural lines or parenchymal bands  (Fig. 7). 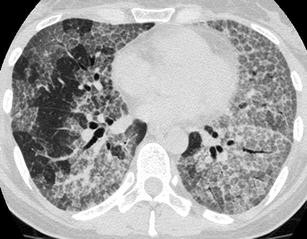 Chronic hypersensitivity pneumonitis (HP) presents with patchy, peripheral or peribronchovascular reticulation and may mimic IPF. It is characterised by the presence of traction bronchiectasis and bronchiolectasis and minimal honeycombing. Areas of ground-glass opacity and hazy centrilobular micronodules may coexist. Relative sparing of the lung bases may be seen and there is no zonal predominance. Lung cysts may be noted in 40 % of patients. The CT findings most helpful in differentiating chronic HP from idiopathic IPF and NSIP are the presence of lobular areas of decreased attenuation and vascularity, the presence of centrilobular nodules and the other than lower zone predominance. There is 50 % diagnostic accuracy of HRCT in providing confident diagnosis between chronic HP, IPF and NSIP  (Fig. 8). The most common histological types of interstitial lung disease in rheumatoid arthritis (RA) are UIP and NSIP and therefore RA may present with a reticular pattern mimicking entirely IPF or NSIP. The HRCT appearance is subpleural and basal reticulation with mild honeycombing. Differentiating findings may be the associated centrilobular nodules and frank bronchiectases reflecting coexistence of airways disease, as well as pleural thickening and pleural effusion  (Fig. 9). 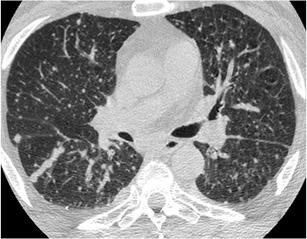 Desquamative interstitial pneumonitis (DIP) may rarely mimic IPF, as it may present with subpleural basal minor reticulation. Honeycombing is usually absent, although in late stages minimal honeycombing may be seen. Ground-glass opacity is a common finding and the presence of emphysema and lung cysts may help in the differential diagnosis  (Fig. 10). 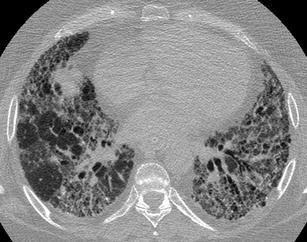 Occasionally end-stage sarcoidosis presents with a pure reticular pattern mimicking IPF. It may be characterised by thickening of interlobular septae, presence of intralobular linear opacities, traction bronchiectasis and honeycombing. Key findings that support the diagnosis of sarcoidosis are the middle-upper lung zone predominance, the nodular thickening of the peribronchovascular interstitium and the symmetric lymphnode enlargement, which may occasionally be calcified  (Fig. 11). 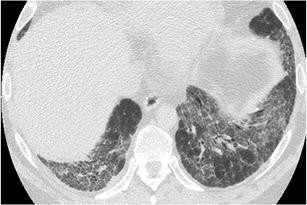 Ground-glass pattern on HRCT is defined as hazy increase in opacity with preservation of bronchial and vascular markings. Whatever the cause may be—i.e. the partial filling of airspaces, the interstitial thickening, the partial collapse of alveoli or the increased capillary blood volume—they all lead to partial displacement of air . 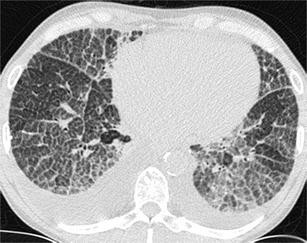 The classic entity appearing with ground-glass pattern as the predominant pattern is subacute hypersensitivity pneumonitis (HP) characterised by symmetric patchy or diffuse bilateral areas of ground-glass opacity associated with poorly defined small centrilobular nodules. The above findings may be diffuse throughout the lungs or predominate in the middle and lower lung zones. A characteristic finding that helps differentiate subacute HP from other mimics is the presence of lobular areas of decreased attenuation and vascularity on inspiratory images and air-trapping on expiratory images  (Fig. 12). Another clue form the clinical history is the absence of smoking since HP is much less common in smokers . 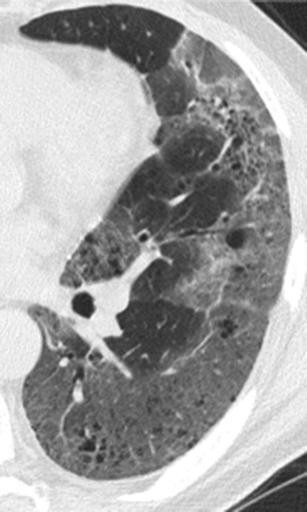 The most common “mimics” of ground-glass pattern are respiratory bronchiolitis-associated interstitial lung disease (RB-ILD), desquamative interstitial pneumonia (DIP), and Pneumocystis pneumonia. 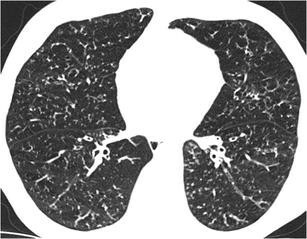 Respiratory bronchiolitis-associated interstitial lung disease (RB-ILD) may also demonstrate with ground-glass pattern as the predominant pattern and mimic subacute hypersensitivity pneumonitis. RB-ILD may exhibit moderate to extensive bilateral ground-glass opacities associated with poorly defined centrilobular nodules of ground-glass attenuation  (Fig. 13). 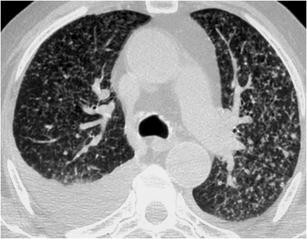 Air-trapping seen on end-expiratory CT and bronchial wall thickening are auxiliary findings. Occasionally, mild reticulation may be seen in the lung bases. Clues for the distinction between RBILD and subacute HP are the presence of mild emphysema in the upper lobes and the invariable history of smoking as HP is uncommon in smokers . Desquamative interstitial pneumonia (DIP) typically manifests with diffuse ground-glass opacity as the primary pattern with a subpleural and lower lung predominance. A mild subpleural reticular pattern may be seen in half of the cases. Honeycombing and traction bronchiectasis are minimal—if any. Centrilobular emphysema is also seen in DIP as in RBILD, but mild lower zone reticulation is probably more often expected in DIP rather than RBILD . History of smoking should accompany a diagnosis of DIP as it is almost invariably associated with cigarette smoking. Pneumocystis pneumonia typically presents with extensive ground-glass attenuation that may be patchy or diffuse with a central, perihilar and upper lobe predominance. Accompanying findings may be the thickening of the interlobular septae and rarely the “crazy paving” pattern. Less common manifestations may include the upper lobe lung cysts and areas of consolidation. Differentiating findings from HP may be the presence of upper lobe cysts and the associated “crazy paving” pattern  (Fig. 14). History of immunosuppression, and especially AIDS, favours the diagnosis of Pneumocystis pneumonia. “Crazy paving” pattern is characterised on HRCT by the presence of thickened interlobular septae and intralobular lines superimposed on a background of ground-glass opacity, resembling irregularly shaped paving stones . This pattern was initially described in alveolar proteinosis, which typically presents bilateral ground-glass opacities associated with smooth septal thickening in a patchy and geographic distribution  (Fig. 15). The findings are predominantly located at perihilar and lower lobe zones and the differential diagnosis from pulmonary oedema is based on the absence of cardiac enlargement and the lack of upper lobe vessels distention. The most commonly encountered mimics of “crazy paving” pattern are Pneumocystis pneumonia, exogenous lipoid pneumonia, sarcoidosis, diffuse alveolar haemorrhage, viral and opportunistic infections and invasive mucinous adenocarcinoma. Pneumocystis pneumonia may mimic alveolar proteinosis—although it may rarely present with “crazy paving” pattern as the predominant pattern, especially at the resolving or subacute stage . Histological features contributing to the ground-glass attenuation are the foamy nature of the alveolar exudates and the thickening of the alveolar walls by oedema and cellular infiltrates . Clues that are in favour of Pneumocystis pneumonia may be the coexistence of upper lobe lung cysts, and the knowledge of the stage of the disease during treatment. Although exogenous lipoid pneumonia (ELP) typically presents with consolidation, that is typically low in attenuation (−100 HU), it may also manifest with geographic areas of ground-glass attenuation surrounded by interlobular septal thickening, representing a “crazy paving” pattern. In terms of HRCT, distinctive features that favour lipoid pneumonia over alveolar proteinosis are the presence of ill-defined centrilobular nodules and the coexistence of consolidation . Transbronchial biopsy, bronchoalveolar lavage and a history of oil ingestion are usually diagnostic for ELP. Sarcoidosis may rarely present with a “crazy paving” pattern as the predominant pattern, but since sarcoidosis is the greatest mimicker of interstitial lung diseases, one should bear in mind this rare but significant “face” of sarcoidosis [27, 29] (Fig. 16). Key findings for the diagnosis of sarcoidosis are the more typical findings of sarcoidosis that may coexist as ancillary findings, i.e. the micronodules along all aspects of interstitium, the beading of the fissures and the lymphadenopathy. Diffuse alveolar haemorrhage may result from various causes, including systemic, autoimmune, idiopathic and drug-induced reactions. Diffuse or focal pulmonary haemorrhage may manifest a “crazy paving” pattern especially at the subacute stage, representing the accumulation of hemosiderin-laden macrophages in the interstitium [27, 30] (Fig. 17). The association with areas of consolidation and the clinical history of haemoptysis are helpful for diagnosis. Viral and opportunistic infections (adenovirus, herpes simplex, influenza virus, cytomegalovirus, respiratory syncytial virus and toxoplasmosis) in immunocompromised patients may commonly manifest with “crazy paving pattern”, as the predominant pattern. Key finding in these cases is the knowledge of immunosuppression from the clinical history . One of the many faces of adenocarcinoma on HRCT is “crazy paving”, in which the ground-glass attenuation reflects low-density intra-alveolar material (glycoprotein) and the superimposed interlobular septal thickening, which is caused by interstitial infiltration from inflammatory or tumour cells. Key finding in the diagnosis of invasive mucinous adenocarcinoma is the non-resolving consolidation or ground-glass opacity on follow-up imaging  (Fig. 18). Occasionally, there may be coexistence of ground-glass pattern and reticular pattern—as defined earlier—in the same areas of the lungs and this combination is invariably equal to the presence of irreversible fibrosis . Non-specific interstitial pneumonia (NSIP) presents most commonly with this combination of patterns as the predominant pattern. It manifests lower lobe predominant ground-glass opacities associated with mild reticulation. Distinctive findings are the absence or minimal honeycombing and the relative subpleural sparing of reticulation and ground-glass opacity [15, 16, 18] (Fig. 19). 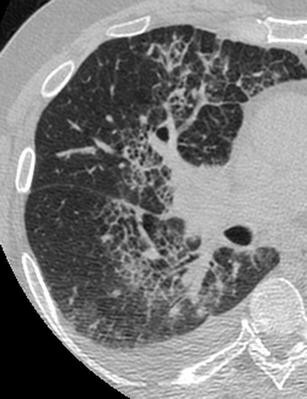 The most clinically important mimics of mixed ground-glass–reticular pattern are scleroderma, idiopathic pulmonary fibrosis (IPF) and desquamative interstitial pneumonia (DIP). Pulmonary involvement of scleroderma mimics NSIP as this is the most common histological type of fibrosis with which it presents . Therefore, the two entities may be indistinguishable from each other in terms of HRCT findings regarding the interstitium. Key findings favouring scleroderma are the possible dilatation of the oesophagus and the dilatation of the pulmonary artery (exceeding the diameter of the adjacent ascending aorta)  (Fig. 20). Idiopathic pulmonary fibrosis (IPF) may occasionally be indistinguishable from NSIP, as IPF may present less commonly with the combination of ground-glass and reticular pattern as the predominant pattern. HRCT has a specificity ranging from 63 to 70 % in distinguishing IPF from NSIP  (Fig. 21). Differential diagnosis in favour of IPF is based on the presence of less ground-glass opacity and more coarse reticulation and honeycombing. Although “pure” desquamative interstitial pneumonia (DIP) is a rare entity, its most common pattern is that of ground-glass opacity associated with mild reticulation, which may mimic NSIP [20, 36] In DIP there is no subpleural sparing while coarse reticulation, such as honeycombing, is usually absent (Fig. 22). A minor CT feature which may help in the differential diagnosis is the presence of small microcysts that may either represent emphysema (since the patients are almost always smokers), bronchiolectasis or dilated alveolar ducts (without any obvious honeycomb fibrosis) . A nodular pattern is characterised on HRCT by the presence of numerous rounded opacities that range from 2 mm to 1 cm in diameter, with micronodules defined as smaller than 3 mm in diameter . The differential diagnosis—apart from the clinical setting and the ancillary findings—is largely based on the three different patterns of anatomic distribution: perilymphatic, random, and centrilobular. The perilymphatic distribution is characterised by presence of nodules along the peribronchovascular interstitium, interlobular septa and subpleural areas. Random distribution demonstrates nodules without any particular site predominance. Centrilobular nodules are located several millimetres away from the pleural surfaces, interlobar fissures or interlobular septa. Centrilobular distribution further divides into nodules with and without tree-in-bud distribution. Moreover centrilobular nodules without any “tree-in-bud” pattern may be either of homogeneous density or of ground-glass texture. Sarcoidosis is typically characterised by a nodular pattern with perilymphatic distribution. A highly distinctive finding is the middle and upper lung zone predominance centrally at the perihilar region. Other findings that support the diagnosis of sarcoidosis are the beading of the fissures, the mediastinal and hilar lymphadenopathy that occasionally is calcified like “icing-sugar” and the presence of air-trapping on expiration  (Fig. 23). Silicosis is a mimic of sarcoidosis and typically manifests with perilymphatic and centrilobular sharply defined micronodules ranging from 2 to 5 mm. The nodules tend to be sharply defined and of homogeneous density and have a characteristic upper lobe and posterior predominance. Distinctive findings supporting the diagnosis of silicosis are the conglomerate masses formed by the coalescence of micronodules, the egg-shell calcification of lymph nodes (rare, only in 5 % of cases) and the formation of pseudoplaques subpleurally, again by the coalescence of subpleurally based micronodules. Knowledge of history of exposure does not leave any doubt in most of the cases  (Fig. 24). 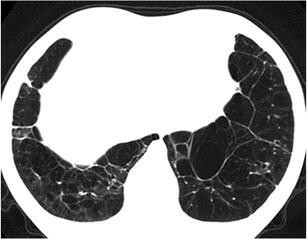 Although coal worker pneumoconiosis (CWP) and silicosis are two distinct entities caused by inhalation of different inorganic dusts, the radiographic and HRCT findings are often indistinguishable and the one disease mimics the other. A distinctive characteristic occasionally is that the micronodules of CWP tend to be less sharply defined and of more granular density than that of silicosis  (Fig. 25). Lymphangitic carcinomatosis and lymphoproliferative diseases, such as lymphoma, may present with perilymphatic nodules but this does not usually constitute their predominant HRCT pattern and they are accompanied by other findings such as septal thickening (in the former case) and large parenchymal nodules or masses (in the latter case) that help in the differential diagnosis [3, 41]. 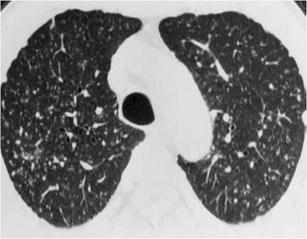 Miliary tuberculosis is a typical example of randomly distributed micronodules throughout both lungs ranging for 1 to 3 mm. The micronodules are of uniform diameter and have an even distribution within the lungs. It may be impossible to distinguish infectious from neoplastic causes of miliary disease on imaging. However, miliary tuberculosis may more commonly be accompanied by lymphadenopathy and pleural effusion  (Fig. 26). The most commonly encountered mimics of nodular pattern with random distribution are miliary metastatic disease, as well as other miliary infections such as miliary candidiasis . Miliary metastatic disease presents with randomly distributed nodules, which—unlike miliary tuberculosis—may have a variable size (up to 1 cm), uniform or not. They are usually located in the outer third of the lung, have lower zone predominance and meet the criterion of “too many nodules to count”  (Fig. 27). The tree-in-bud pattern represents centrilobular branching structures that resemble a budding tree. The pattern reflects a spectrum of endobronchiolar and peribronchiolar disorders, including mucoid impaction, inflammation, fibrosis and occasionally endovascular disorders such as neoplastic processes. This pattern was initially described for panbronchiolitis, which is a rare entity affecting mainly Japanese and Korean middle-aged men. 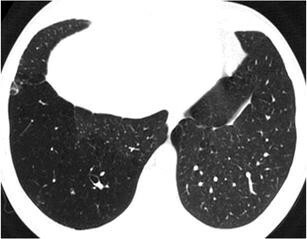 It is characterised by diffuse bilateral distribution of “tree-in-bud” pattern with lower lobe predominance and associated bronchiolectasis and bronchiectasis, late in the disease process [44, 45] (Fig. 28). Distinctive findings from other causes of “tree-in-bud” pattern may be the diffuse distribution and the prominent air-trapping on expiration. The most clinically important mimics of nodular with centrilobular tree-in-bud pattern are endobronchial spread of tuberculosis, atypical mycobacteria infection and metastatic tumour emboli. 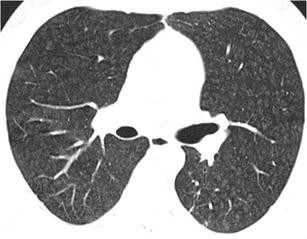 Endobronchial spread of tuberculosis is a famous representative of this HRCT pattern, which can be differentiated from panbronchiolitis based on the more focal and asymmetric distribution of “tree-in-bud” pattern. Associated cavitated nodules, mediastinal lymphadenopathy and pleural effusions also favour the diagnosis of tuberculosis  (Fig. 29). Atypical mycobacteria infection may mimic endobronchial spread of tuberculosis presenting with scattered areas of “tree-in-bud” pattern. Key findings that favour the diagnosis of atypical mycobacteria infection are the presence of multilobar, cylindrical bronchiectasis that tends to be more severe in middle lobe and lingula and the characteristic age of the affected patients: elderly women [47, 48] (Fig. 30). Other less common causes of infection that may present with a nodular tree-in bud pattern are pulmonary candidiasis . bronchoinvasive aspergillosis  and CMV pneumonia . Metastastatic tumour emboli in pulmonary arterioles may also present with a “tree-in-bud” pattern, which in this case refers to the vascular rather than the bronchial tree. It is either caused by the filling of the centrilobular arteries with tumour emboli or by the fibrocellular intimal hyperplasia induced by tumour microemboli. Ancillary findings may be the multifocal dilatation and beading of arteries, the thickening of the interlobular septae and small wedge-shaped peripheral opacities, secondary to microinfarcts . This pattern is characterised by the presence of poorly defined centrilobular nodules of ground-glass attenuation that appear from the pleural surface, fissures or interlobular septa by several millimetres [4, 41]. 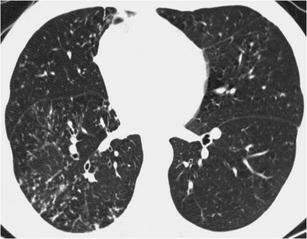 The classic example for this pattern is subacute hypersensitivity pneumonitis, which commonly presents with this pattern as the predominant one (Fig. 31). Associated key findings are the geographic areas of ground-glass opacity and the lobular areas of decreased attenuation and vascularity with air-trapping on expiration. The centrilobular nodules are usually diffuse with middle & lower lobe predominance. Apart from the integration with the clinical history of exposure and the significant improvement with the removal of the patient from the offending environmental agent, another helpful clue is the absence of smoking history since it is known that smokers are somehow “protected” from developing hypersensitivity pneumonitis [53, 54]. The most commonly encountered mimics of nodular ill-defined centrilobular pattern are respiratory bronchiolitis–associated with interstitial lung disease (RBILD), cryptogenic organising pneumonia, lymphocytic interstitial pneumonia and follicular bronchiolitis. 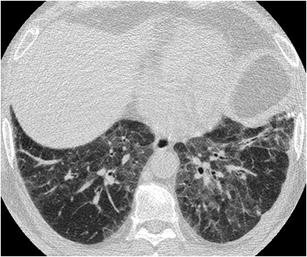 RBILD mimics hypersensitivity pneumonitis and may present with ill-defined centrilobular micronodules of ground-glass attenuation as the predominant pattern. In RB-ILD the micronodules display a distinctly upper lobe predominance and may be fewer in number than those seen in patients with subacute hypersensitivity pneumonitis  (Fig. 32). In RB-ILD there is centrilobular or paraseptal emphysema in the upper lobes, which is of mild severity despite the fact that most of the patients are heavy smokers. 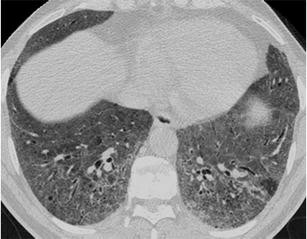 The differential diagnosis between RBILD and HP is often impossible on imaging grounds only, and the distinction is based on the smoking history as hypersensitivity pneumonitis is uncommon in smokers [22, 55]. 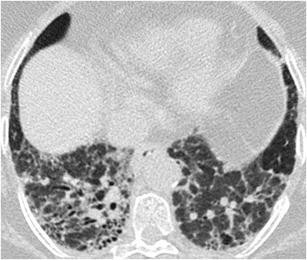 Cryptogenic organising pneumonia may rarely present with diffusely distributed, ill-defined centrilobular micronodules of less than 4 mm as the predominant pattern and thus mimic subacute hypersensitivity pneumonitis . Organising pneumonia may occasionally present with a distinct bronchiolocentric distribution limited to the alveoli immediately adjacent to the involved bronchioles, thus giving a miliary pattern . Distinction from hypersensitivity pneumonitis and RBILD is based on the absence of lobular areas of decreased attenuation and absence of emphysema (Fig. 33). Lymphocytic interstitial pneumonia (LIP) and follicular bronchiolitis may both present with centrilobular micronodules of ground-glass attenuation as the predominant pattern and mimic subacute hypersensitivity pneumonitis. They are considered to represent two ends of a spectrum, with follicular bronchiolitis localised more to the peribronchiolar region and with LIP being more diffuse in the secondary pulmonary lobule. In case of LIP distinctive findings on HRCT may be the associated thickening of the interlobular septae, thin-walled lung cysts, areas of ground-glass opacity and slightly enlarged mediastinal lymphadenopathy. A significant clue from the clinical history is that both entities are strongly associated with underlying autoimmune disease or immunodeficiency, Sjogren’s syndrome, dysproteinaemia or AIDS [58, 59]. A reticulonodular pattern is characterised by the co-occurrence of reticular and micronodular patterns. The micronodules may either be located at the centre of the reticular elements (centrilobular micronodules) or on the linear opacities representing septal or peribronchovascular micronodules . 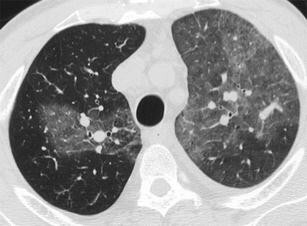 A typical example of predominantly reticulonodular pattern is sarcoidosis. It is characterised by the presence of perilymphatic and peribronchovascular micronodules, as well as of the thickening of interlobular septae and peribronchovascular interstitium and presence of intralobular linear opacities. The characteristic middle and upper lung zone distribution with central-parahilar predominance and the presence of mediastinal and hilar lymphadenopathy usually lead to the correct diagnosis, obviating the need for lung biopsy. Air-trapping on expiration is another key finding that usually accompanies sarcoidosis [7, 60] (Fig. 34). Berylliosis is the most important mimic of sarcoidosis on imaging and cannot be distinguished from it even on histological basis. Its main HRCT manifestations are the co-occurrence of perilymphatic nodules, thickening of interlobular septa and peribronchovascular interstitial thickening . Lymphadenopathy is expected to be less pronounced than sarcoidosis and the main key finding to reach the correct diagnosis seem to rest on the knowledge of history of exposure. Lymphangitic carcinomatosis may occasionally present with a reticulonodular pattern characterised by irregular, nodular thickening of the interlobular septae and of the bronchovascular bundles. 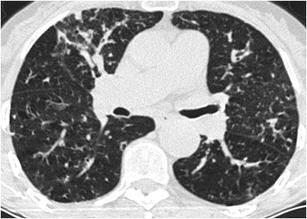 Differentiating CT findings from sarcoidosis are the preservation of the architecture of the secondary pulmonary lobule, the more diffuse distribution if it is secondary to extrapulmonary cancer or the confinement to one lobe or lung if it is secondary to lung cancer and the less common incidence of mediastinal lymphadenopathy . Cystic pattern is composed by well-defined, round and circumscribed air-containing parenchymal spaces with a well-defined wall and interface with normal lung. The wall of the cysts may be uniform or varied in thickness, but usually is thin (<2 mm) and occurs without associated emphysema . A classic entity presenting with cystic pattern is lymphangioleiomyomatosis (LAM), characterised by the presence of usually round, thin walled lung cysts which have no zonal predominance and are distributed diffusely including the costophrenic angles and the lung bases (Fig. 35). LAM may present with pleural effusion representing chylothorax. Key findings in terms of HRCT criteria is the diffuse distribution of cysts and in terms of clinical history the knowledge that it affects almost exclusively women in child bearing age . The most clinically important mimics of cystic pattern are pulmonary histiocytosis, lymphocytic interstitial pneumonia (LIP) and centrilobular emphysema. Pulmonary histiocytosis mimics LAM when it is in the purely cystic phase (third phase following the purely nodular and nodular-cystic phase). It is characterised by the presence of thin- and thick-walled lung cysts that have a bizarre shape, resembling cloverleaf. Cysts have a characteristic upper and middle lung zone predominance sparing the costophrenic angles and the lung bases (Fig. 36). Occasionally, few scattered nodules may coexist (representing Langerhans granulomas) as well as areas of ground-glass opacity. Key findings are the sparing of costophrenic angles and of the medial parts of anterior parts of middle lobe and lingula, the concurrence of even one nodule and the history of smoking since it occurs in young heavy smokers . 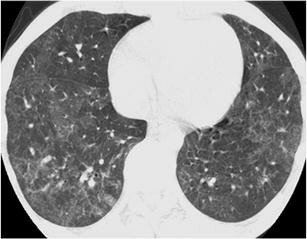 LIP may rarely present with diffuse lung cysts as the predominant HRCT pattern  (Fig. 37). Key findings in the differential diagnosis that favour LIP is the association with other ancillary findings such as diffuse or patchy areas of ground-glass opacity, ill-defined centrilobular nodules and thickening of the bronchovascular bundles. Moreover, the clinical history of the primary disease causing some degree of immunosuppression (such as Sjogren’s disease, AIDS, autoimmune disorders, dysproteinemia) gives a strong clue towards LIP. 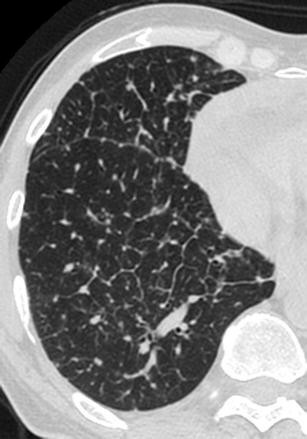 Centrilobular emphysema, although not characterised by the presence of “true” cysts, may occasionally mimic other interstitial lung diseases expressed by a cystic pattern. Distinctive findings on HRCT that favour centrilobular emphysema are the absence of perceptible wall of the small centrilobular lucencies with characteristic upper lobe predominance and the presence of a “white dot” in the middle of these lucencies representing the centrilobular artery  (Fig. 38). This combined HRCT pattern is characterised by the co-occurrence of two already mentioned HRCT patterns, i.e. the cystic pattern and the ground-glass pattern. Classic example of this combined pattern as the predominant pattern is Pneumocystis pneumonia, which is characterised by the presence of patchy or diffuse bilateral ground-glass opacities with thick or thin-walled, irregular, septated cysts in the upper lobes. A significant key from the clinical history is the history of immunosuppression or more specifically the history of AIDS  (Fig. 39). 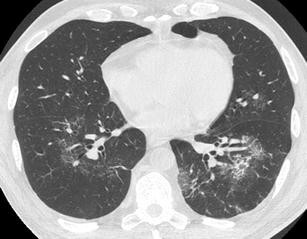 The most clinically important mimics of combined cystic and ground-glass pattern are lymphocytic interstitial pneumonia, subacute hypersensitivity pneumonitis and desquamative interstitial pneumonia. Lymphocytic interstitial pneumonia may present with this combined pattern as the predominant pattern and may occasionally mimic Pneumocystis pneumonia. Distinctive HRCT findings are the thin wall and the more rounded shape of the cysts, the possible associated thickening of the bronchovascular bundles and the mediastinal lymphadenopathy which occurs in 70 % of these patients  (Fig. 40). Once again, the knowledge of the primary disease from the clinical history causing some degree of immunosuppression (such as Sjogren’s disease, AIDS, Castleman’s, AIDS, autoimmune disorders or dysproteinemia) gives a strong clue towards LIP. 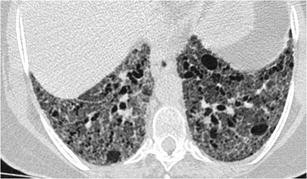 Subacute hypersensitivity pneumonitis (HP) may also manifest with this combined HRCT pattern as the predominant pattern. However, in case of HP the lung cysts are reported to be few in number and thin-walled . The distinctive HRCT finding is characteristic lobular areas of decreased attenuation, even from the inspiratory images and the absence of smoking history, since smokers very rarely develop HP . 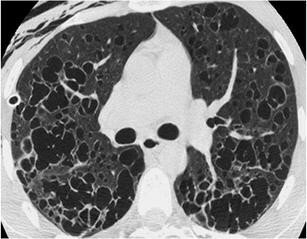 Desquamative interstitial pneumonia (DIP) is another entity that may present with this combined pattern. In case of DIP, the diffuse or patchy areas of ground-glass opacity have lower lobe predominance and the scattered “lucencies” may or may not have true walls, either representing “true cysts” or else emphysema or traction bronchiectasis. The patient has to be a smoker based on the clinical history, since DIP develops almost always in heavy smokers [20, 36] (Fig. 41). The decreased attenuation pattern is defined as areas of low density corresponding to parenchymal destruction and reduced perfusion, and attenuation of the pulmonary vasculature. It is also known as the “black lung” pattern. 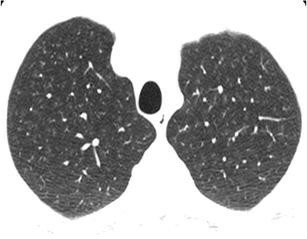 The classic example of this pattern is obliterative bronchiolitis, characterised by the presence of diffuse areas of low density with small calibre vessels seen within (vessel paucity). There is no zonal predominance and the distribution may be diffuse or patchy (see also “mosaic attenuation pattern”). Air trapping is noted on expiratory phase and there is also associated cylindrical bronchiectasis  (Fig. 42). 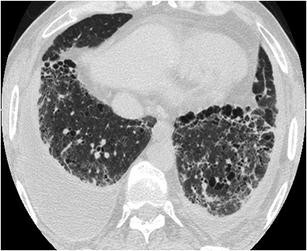 Panlobular emphysema is actually the only mimic of obliterative bronchiolitis and presenting as “lucent” lung with small or absent vessels and associated bronchial dilatation with bronchial wall thickening. HRCT features favouring panlobular emphysema are the typical lower lobe predominance, the characteristic presence of thick, “long” interlobular septae in lucent lung like a “web”, the parenchymal destruction and the vascular distortion (Fig. 43). The clinical history of α-1 antitrypsin deficiency undoubtedly leads to the correct diagnosis . This pattern is characterised by a patchwork of intermingled areas of increased and decreased attenuation that may represent (1) patchy interstitial disease, (2) obliterative small airways disease and (3) occlusive small vascular disease . The classic example of this pattern (as well as of the “decreased attenuation pattern”) is obliterative bronchiolitis (OB), as it can also present with patchy areas of decreased attenuation intermingled with areas of increased attenuation. Air-trapping (represented by areas of decreased attenuation) secondary to focal areas of bronchial or bronchiolar obstruction can be accentuated at expiration. Obliterative bronchiolitis can also accompany large airways diseases such as post infection bronchiectasis, cystic fibrosis (Fig. 44) or present as the major pulmonary manifestation of graft-versus-host disease . Chronic thromboembolic pulmonary hypertension may present with mosaic attenuation pattern due to patchy vascular hypoxemia. In case of vascular hypoxemia, however, there is significantly reduced calibre of the vessels in areas of decreased attenuation and there is no enhancement of the differing attenuations in expiratory scan compared with “mosaic attenuation” secondary to small airways disease  (Fig. 45). 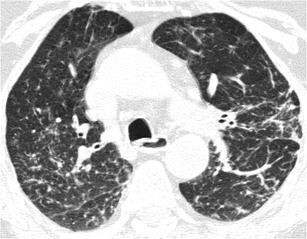 Subacute hypersensitivity pneumonitis may also exhibit a mosaic attenuation pattern, combining both an “interstitial” cause, manifesting as areas of increased attenuation (ground-glass opacity), and a “small airways disease” cause, manifesting as areas of decreased attenuation, which may accentuate on expiratory CT . Respiratory bronchiolitis may also occasionally produce this pattern. Evaluation of interstitial lung diseases on HRCT is based on an HRCT-pattern approach to diagnosis, where there should be effort to assign the predominant HRCT pattern to each case. There are various mimics in each HRCT pattern and one entity may have many faces and therefore may mimic many patterns. There may also be possible overlap of HRCT patterns in one case. Moreover, we should keep in mind that no HRCT pattern provides a specific etiological diagnosis. In order to reach a correct and confident diagnosis, one should approach the predominant HRCT pattern by identifying any specific and distinctive imaging clues and try to narrow the differential diagnosis by integrating the HRCT findings with the clinical and laboratory findings.